The 2nd international forum the Russian Energy Week, which will last four days, has kicked off on October 3 in Moscow, Russia. The main issue of panel discussions is sustainability of energy in a changing world. The Russian Energy Week is attended by Qatar Minister of Energy and Industry Mohammed Saleh Al Sada, North Korean Electric Power Industry Minister Kim Man Su, Serbian Minister of Energy and Mining Aleksandar Antic, Belarusian Energy Minister Viktor Karankevich, Minister of Mines and Hydrocarbons of Equatorial Guinea Gabriel Mbaga Obiang Lima, Hungarian Minister of Foreign Affairs and Trade Peter Szijjarto and other officials. 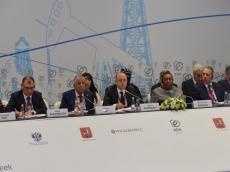 Azerbaijani Energy Minister Parviz Shahbazov also took part in forum and held a series of meetings. The minister informed the participants about the main achievements of the country in the energy sector and developments in the field of renewable sources. “Over 15 years, the economy of Azerbaijan grew by more than 3.5 times. More than $250 billion was invested, half of which - foreign direct investment. As many as $95 billion was invested in the oil and gas sector. We have rather seriously diversified our routes - we have different means of delivery in different directions, mainly oil and gas pipelines. Our last achievement in the field of energy is the implementation one of the largest gas projects in the world - the Southern Gas Corridor,” the minister stressed. He went on to say that through this pipeline, the length of which is more than 3,500 km, gas will be delivered to Georgia, Turkey, as well as to European countries and the Balkan countries, including Bulgaria, Greece, Albania, and the south of Italy. Further, the Energy Minister underlined that Azerbaijan has proved to be a very reliable partner in all energy projects. “We have huge investments in the energy sector, primarily in oil and gas. Today, we plan to develop the renewable energy sector. We have a great potential for that. We intend to create a separate serious legislative base for the development of renewable energy sources. At the same time, we want to create incentive mechanisms in this sector. No matter how this sphere develops, government’s support is always needed. Now we are optimizing our projects on power lines that we were able to take the necessary electric power, which we intend to generate from renewable energy sources,” Shahbazov underlined. Speaking of the Strategic Road Map, the minister noted that since 2016, a large reform program is being implemented in Azerbaijan, further adding one of the main parts of these reforms is related to the energy sector. “Therefore, taking all this into account, I want to address representatives of many countries from here and invite them to Azerbaijan to jointly implement new projects. International cooperation for Azerbaijan in the energy sector has always been a priority,” he emphasized. Touching upon the oil production in the country, Shahbazov told journalists that the production will increase slightly by the end of 2018 compared with the current level. He mentioned that in September, the volume of raw material production in Azerbaijan almost did not change compared to August and amounted to 773,000 barrels per day, adding that the growth of oil production will ensure an increase in gas condensate production and investment. In August, daily oil production in Azerbaijan amounted to 774,000 barrels, of which 716,000 were oil, and 58,000 condensate. Some 19,000 barrels of oil were exported. During the meeting with the Azerbaijani Minister, Minister of Foreign Affairs and Trade of Hungary Peter Szijjarto said that his country is interested in participating in the Southern Gas Corridor project. Szijjarto pointed out the importance of holding a dialogue between relevant ministries of the two countries. The sides also exchange views on areas of cooperation in the energy sector between Azerbaijan and Hungary. Further, Shahbazov held the meeting with Mongolia’s Energy Minister Davaasuren Tserenpil and expressed gratitude for the fact that Mongolia refused to chair the conference of the energy charter in 2020 in favor of Azerbaijan. The meeting discussed prospects for cooperation in geological exploration in the energy sector, particularly in the oil and gas sector between the two countries, and considered the possibility of studying Mongolian students at relevant universities in Azerbaijan in the oil and gas specialty.